next #creativeHE meetup is on the 22nd of June > Join us! A warm and open invitation to join the next #creativeHEmeetup on the 1st of June! Our next and last meetup during this academic year will take place at Manchester Metropolitan University on the 22nd of June, 12-2 pm in the All Saints Library, room 5.11 (report to reception). The focus of this meetup is the creative use of collage. Staff, students and the wider public, all very welcome. 22 June 18 (8): This was our last meetup in this academic year. 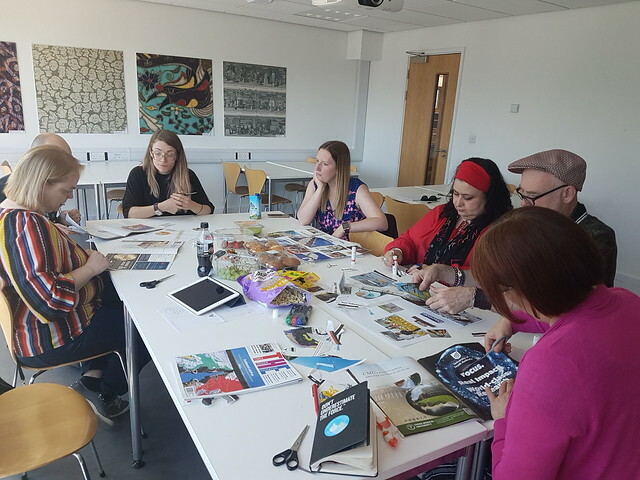 We met at Manchester Met and a colleague from UCLAN facilitated a discussion and a hands-on workshop around using collage in learning and teaching. It was fascinating to experience how snippets of paper could generate such deep and creative engagement! Dr Anna Hunter from UCLAN was leading the session and shared her experience of using collage in the context of academic development at her institution. I think the opportunities are endless and the more we explore the more diverse tools and approaches we add to our toolkit to make learning and teaching stimulating. Wishing you all a lovely summer and thank you for joining us on this journey this academic year. This entry was posted in CreativeHE and tagged #creativeHE meetup, #creativeHEmeetup, collage, CreativeHE by Chrissi Nerantzi. Bookmark the permalink.